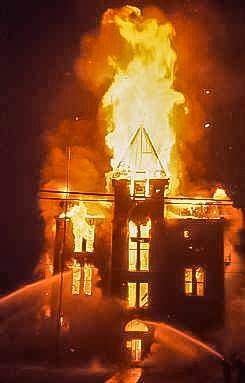 On Wednesday, Nov. 27th, 1963, a paper carrier for Guthrian, Bruce Walters, discovered a fire at the courthouse around 6 a.m., which in the end completely destroyed it. The fire was thought to have started in the furnace room in the basement. Many of the counties records were lost but many survived. A blacksmith with the aid of a country welder cut into the records vault. Although damaged to some degree, many records were legible. owner of Miller Shoe Store from 1947-1968. He and his family lived 4 blocks north of the courthouse. the ammunition in the sheriffs' office exploding.